70% percent or more of our food contains genetically engineered food brought by the bio-tech giant: Monsanto. GMO is endangering people's health and our environment at an alarming rate. Cross-contamination is irreversible and good, organic crops are being jeopardized. These seeds are incredibly expensive compared to the traditional ones and have been genetically modified to produce their own pesticide, to survive the spraying of the: "Roundup", a potent herbicide and to self terminate. This has lead our farmers to buy new GMO seeds each year and depend on Monsanto (now Bayer). As a result of this ruthless drive to use India as a testing ground for genetically modified crops, 125,000 farmers took their own lives. These people were driven to debt, to economic distress, homeless and landless. GMO has and is failing catastrophically. This company is persecuting, bullying and bringing farms to bankruptcy. 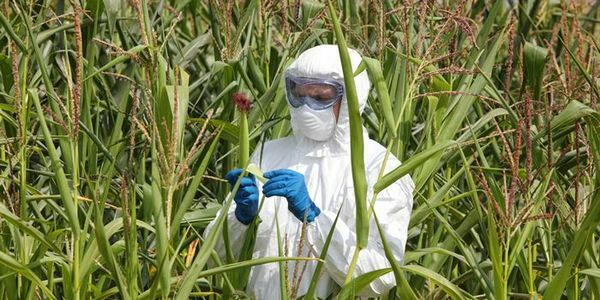 GMO was never adequately tested for safety, actually more and more research shows its dangers to the human/animal health, polluting our crops and our water. Clarence Thomas, Gwendolyn S. King, Linda Fisher, Jim Travis, Linda Avery Strachanand, Toby Moffet , Marcia Hale, Donald Bandle, George H. Poste, Michael Kantor and Michael Taylor all bending rules, finding loopholes to assure this company profits. This technology is only exacerbating hunger, poverty, irreversible contamination and climate change in our world. Bring down GMO and eliminate it from our food and land, and eliminate a centralized agriculture. Bring down Monsanto's genetically engineered seeds. Bring down the use of harmful pesticides, herbicides and chemicals alike. Hold this company accountable for its damages to the world. Organic agriculture, permaculture and biodiversity are the only answer to sustainability, to the preservation of our environment and our health. We want you, as our government, as a body of representation of the people of the United States to invest billions subsidizing organic, environmental agriculture. Bring down Monsanto's (now Bayer) poisoning, companies alike and the agrochemical industry once and for all as it is one of the greatest threats to the whole human race. Please sign and share this petition on Facebook & Twitter. 70% percent or more of our food contains genetically engineered food brought by the bio-tech giant: Monsanto.GMO is endangering people's health and our environment at an alarming rate. This has lead our farmers to buy new GMO seeds each year and depend on Monsanto. As a result of this ruthless drive to use India as a testing ground for genetically modified crops, 125,000 farmers took their own life. Bring down Monsanto's monopoly on our food and a centralized agriculture. Bring down Monsanto's poisoning, companies alike and the agrochemical industry once and for all as it is one of the greatest threats to the whole human race.